Would you like to have a heavy duty drum tumbler that works quickly without creating messes of splashes and spills? You should choose the Standard Drum Tumblers. Mixing contents of one or two steel drums, these Standard Drum Tumblers disperse dyes and colorants thoroughly as well as mix dry powders, wet grains, settled liquids and high viscosity substances in no time. 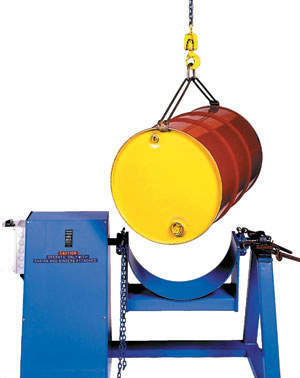 The drum tumblers are heavy duty, with a maximum capacity of 800 lb per drum. Equipped with load binders with safety locks that ensure loaded drums are securely held, the tumblers' strong steel frame stands firm as the drums are tumbled at 13 RPM. During tumbling activity, all shafts run in self-aligning pillow to block ball bearings. These standard drum tumblers come with a control box with start, jog and stop buttons. Choose the motor of your tumblers: TEFC motor (Totally Enclosed Fan Cooled), EP motor (Explosion-Proof TEFC), and Air Motor. You can also decide whether you'd like to have a Single Standard Drum Tumbler or a Dual Standard Drum Tumbler (working with two drums at once). The following lists the complete choices of model for these tumblers.